Heading out to learn a new instrument? Set the sail to explore your talents without worrying much about the cost. Whether you wish to try your luck with stringed, percussion, brass or woodwind instruments, you can buy them all at these places even without a big-budget for it. For all those who love music, this is the one stop solution for you. From pianos, guitars, keyboards, drums, wind instruments and Indian instruments to accessories, amplifiers, covers and cases, everything related the music instruments is available here. You can choose to buy an electric guitar starting at INR 5265 or a drum set starting at INR 8190. The store timings are 10:30am to 8:00pm and is closed on Mondays. If you wish to express yourself through a guitar, a djembes or through an Indian instrument, you can choose Sattva. Though choice of other instruments is not available here but if you have decided on any of these, you can find economical options here. An acoustic guitar starts at INR 8900 and a djembes at INR 2300. Need some time getting used to the guitar you wish to buy and making sure that that’s the one? Well, Divine Music offer rental services to their clients before the actual buy to ensure that the best suited instrument is received by the customers. They provide all range and types of guitars, be it electric, acoustic or electro-acoustic. There electric guitars start at around INR 13000, acoustic at around INR 3500 and electro-acoustic at INR 7900. There store is functional all days of the week from 12 noon to 9:00pm. For those who can’t buy anything without a brand label attach to it, then you must visit this store during your instrument hunt. They provide instruments from almost every music brand under the sun. They provide guitars, percussions and drums, keyboards and even Indian instruments and orchestral accessories among many other products. You can get a medium acoustic guitar at just INR 3375 and a digital keyboard at INR 8639 from the store. The store is open all days of the week from 10:30am to 8:30pm. Whether you wish to rent out an instrument or directly buy it, this is the place for you. They provide guitars, keyboards, drums, percussions and even classical instruments. But they also have more in store for you. 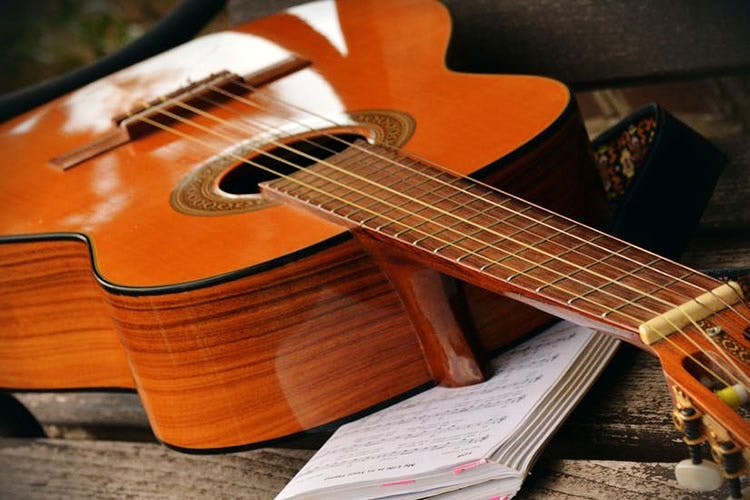 If you are on a real low budget then you can also buy second-hand instruments from there. A Ukulele costs just INR 2999 and a basic keyboard at just INR 2850. The store remains closed on Mondays. For rest of the days the opening timings are 10:00am to 8:00pm.